Create a project budget by entering fixed prices. The fixed price budget is a kind of budget where you don’t estimate any hours and don’t invoice based on rates. The only thing you know is the final project price. In the 3rd step of creating a project (Personnel costs), enter just one activity – e.g. Project work. Then add people to work on the project. 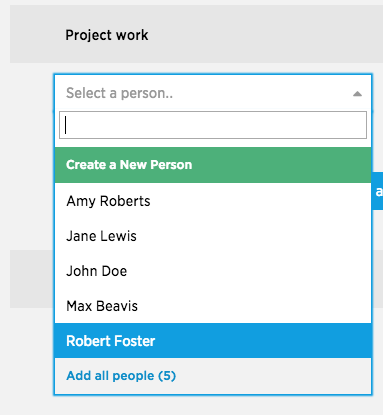 One way is to add people one by one, selecting those who can track time on this project. Another way is to simply add everyone by clicking the Add all people button. Leave the Estimated hours and Client rates of everyone on 0, as the budget is not being calculated by multiplying the hours by the rates. Save the settings by clicking the white Save and continue button in the upper section of the screen, or by clicking the Continue to project expenses button. 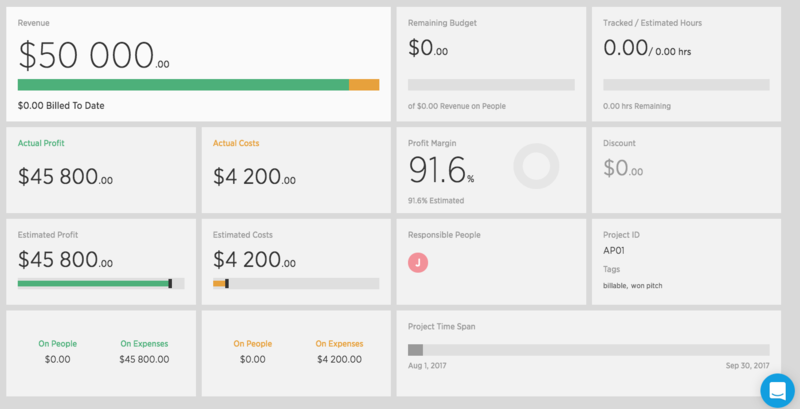 This will take you to the next step of creating a project – the Project expenses. The Project expenses fields are usually used for entering external project expenses. However, it’s also possible to use them for entering a fixed project price. This way, Project expenses will be used for entering a fixed project price. Let’s stay in Project expenses and add all of the external expenses one by one. Enter when you have to pay for it into the Date of purchase field – it’s important for cash flow, as seen in the Company performance graph. Leave a 0 in the Invoiced field, as Development along with photos were part of the original fixed project price. As the budget was created using the fixed price method rather than entering estimated hours and rates, some of the metrics won’t work as expected, simply because it’s mathematically impossible to calculate them. Current project costs (Actual costs) – these only reflect external expenses, as nobody has yet tracked any time and therefore no worked time costs have been generated. None of the people working on the project will have any profits listed in their financial results, as it’s impossible to know what part of the total budget should be allocated to any of them. The process is identical to the one explained above. The only difference is that on the Project expenses screen, the fixed prices of the project components are entered into separate lines.